Thank you for visiting the new homepage of Yoma Villas Bali. We are happy to present you our new villas, located in the quiet and peaceful area of Canggu, only a few minutes away from the world famous Echo Beach – well known among true surfers! Yoma Villas Bali is a tropical retreat for people, looking for comfort, privacy and beauty, together with up-to-date insider information about what to do and what to see in Bali. The owners of Yoma Villas Bali Wayan / Suparmi and her team can help you to make your holidays a very personal and unforgettable experience. 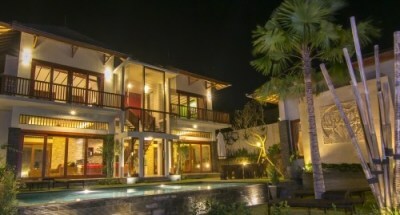 If you are looking for an accommodation in Bali, our villas in the Canggu location should not be missed. Exceptional place to stay – beautiful, safe and very friendly! Stay in our new and modern 2 or 3 bedroom villas with privaty pool and high level of safety. Each of four villas has its own story and atmosphere. Canggu area at its best. Enjoy in-villa services such as traditional Balinese massage, try exceptional traditional local food or order a driver for your maximal comfort. Our Canggu location in is a perfect starting point to explore central Bali´s Ubud, beautiful north region, volcano, numerous temples or southern Bali beaches. Two rooms with double beds and one room with a single bed – the ideal family accommodation or perfectly suited for a group of friends wishing to stay in a place with elegant furnishings, quiet sleeping, dining and living, surrounded by stunning tropical vegetation. The elegant Villa Semeru comes with its own private garden and a large, inviting pool. The carefully landscaped garden – in fact, the biggest of all our villas – stretches out over two levels. Next to your own pool, you find a thatched Alang-Alang Balé. In Villa Semeru, there is everything you desire for an indulgent Canggu accommodation. Villa Batur consists of an equally spectacular main building and a comfortable guesthouse. The main house has 2 bedrooms with double beds and convertible sofas. The guesthouse has a double bed and a convertible sofa. There is plenty of room for up to 9 people. Popular accommodation for a bigger family or group. 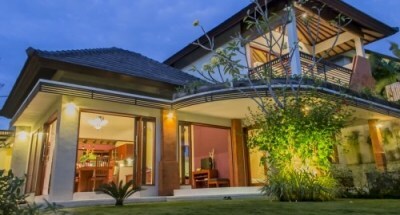 The stylish, L-shaped Villa Tambora in Canggu includes 3 bedrooms. This is the ideal Balinese accommodation if you wish to travel in a group or with your family, enjoying tastefully designed furnishings, quiet sleeping, dining and living, surrounded by beautiful rice fields. This beautiful beach is accessed via a narrow road carved into the rocks. The view from the top is stunning. White sand and clean water make this experience unforgettable. Maybe, like many other people, you love to discover local nature. 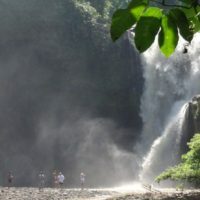 In Bali, there are many beautiful spots worth exploring, including some beautiful waterfalls or vulcanos. Monkey Forest near famous Ubud village is home for hundreds of monkeys. 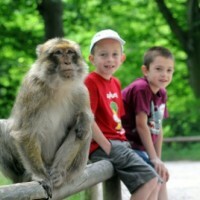 You can feed them with bananas and meet the big and small ones.Experience the true life in nature. An active volcano located at the center of two concentric calderas north west of Mount Agung, close to Batur Natural Hotspring, where you can relax after the morning trek. Find out more about places to go and explore tips for daily trips. Wonderful Gary is a lovely and entertaining host for the serene spot in the world. Just minutes away from the surfing beach, and from the famous Echo beach, where you can find plenty of restaurants without having to go to the hussle and bussle of Seminyak every day. Stayed at this hotel for 6 days. Everything was perfect! Staff very friendly and helpful. Mr. Suma is above all praise. Villa is beautifully furnished and prepared for family recreation. In the kitchen there is all necessary to prepare, but we enjoyed the Breakfast which for us was prepared local girls. For dinner, you can order food from the restaurant or go somewhere by taxi. The swimming pool is not big,but comfortable and clean. There is free water, free Laundry. The rest was super,we did not want to leave! We had a wonderful holiday in Bali, Canggu. The villa (Scarlett) is situated in a beautiful spot surrounded by rice paddy fields. I spent a long time researching villas in Canggu and we were certainly not disappointed with our choice. The villa has been decorated to a very high standard and felt just like home. Suma and Putu cooked a beautiful breakfast for all of us every morning and the Villa was kept amazingly clean for our whole stay. The children spent most of their time in the pool surrounded by an immaculate garden. Yoma Villa Bali accommodation in Canggu area is only 1,5 km from the beach, a 20-minute drive from the stylish shopping and dining area Seminyak, a 10-minute drive from the famous Balinese temple Tanah Lot and from the stunning Nirwana Golf Course. The airport Ngurah Rai is only 45 minutes away. Like the website? Get a search engine optimised website from Catnapweb.